Like Pedro Alvarez, Jay Bruce is a left-handed slugger who has had a good amount of success against the Cardinals over the course of his career. His career slash line against the Cardinals sits at .237/.294/.398. The .398 slugging percentage is nowhere near that of Alvarez (.473), but he still has 12 doubles, 12 home runs, and 44 RBI in 88 career games against the Cardinals. One-third of his production came from last season alone. In 19 games, Bruce hit .315 with four doubles, four home runs, and 15 RBI. Bruce has a career .257/.330/.482 slash line. After taking a look at his slugging percentage against the Cardinals (.398, 84 points lower than his career SLG%), he may not be a true “Cardinal Killer” like Alvarez. However, given his numbers against the Cardinals in 2013 and the fact that one of my readers asked me to take a look at Bruce, I decided to write a post on him anyways. 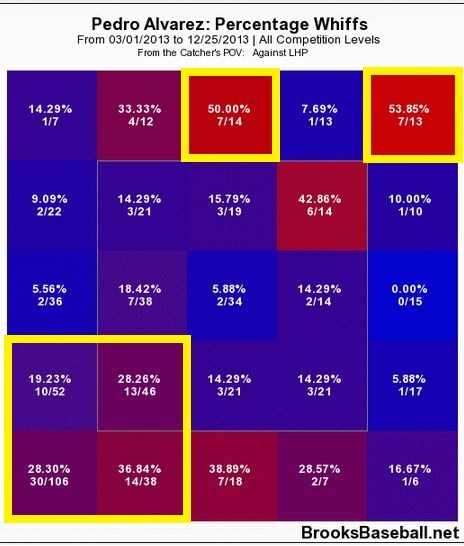 As noted on the following graphs (from BrooksBaseball.net), but to avoid any confusion, all zones are from the catcher’s point of view. Bruce’s 2013 whiff rate against left-handed pitchers was surprisingly low for a lefty slugger who averages 137 strikeouts per season at just 15.9% (136 whiffs/858 pitches). Non-overpowering lefties like Jaime Garcia or Randy Choate can attack the zones boxed in yellow (21.5% whiff rate); whereas, Kevin Siegrist (fastball averaged 96 MPH in 2013) can attack Bruce up in the zones boxed in orange (26.4% whiff rate). Ideally, if one of the above pitchers is looking for a strikeout, they should avoid the inside corners of the strikezone against Bruce. These two zones are boxed in green, and he had just two whiffs on 63 pitches (3.2%) in those zones last season. Right-handed pitchers, especially hard-throwers like Trevor Rosenthal, Carlos Martinez, and Michael Wacha, can attack Bruce up the zone–preferably towards the outside corner. His 2013 whiff rate against right-handed pitchers was also pretty low for a slugger at just 15.3% (290 whiffs/1899 pitches). However, his whiff rate was significantly higher in the zones boxed in yellow (23%) and even higher in the zones boxed in orange (27.6%). Thus, if any of our righties find themselves in a situation where a strikeout is necessary and Bruce is at the plate, their best bet is start him up and away in the zone, with down and out of the strikezone as their primary backup plan. Of 152 balls in play against lefties in 2013, 35 of them were linedrives–23%. 40% of these linedrives came on pitches in the middle of the zone which is to be expected–big league pitchers know to avoid the middle of the zone, especially against sluggers like Bruce. 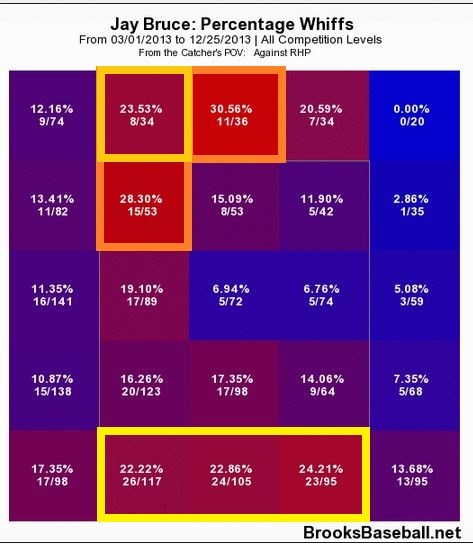 After taking a look at both lefty graphs, it appears that the best place for lefties to attack Bruce is down in the zone from the middle-out (boxed in yellow) where his linedrive percentage is just 12.5%. There is that little blip on the outside corner where nearly 30% of the balls in play were linedrives, but I think this may be due to the small sample size. Either that, or he just loves scorching liners down into the left-field corner. As a fan of the Cardinals, this graph frightened me. There’s a reason why he has a .267/.341/.502 career slash line against right-handed pitchers. I really could not find a glaring hole that Cardinals’ pitchers could exploit. In 2013, on 302 balls put in play, 94 of them (31.1%) were linedrives. This puts him near the top of the league and shows just how potent his bat can be against righties. As I noted in the right-handed pitcher whiffs graph, pitching Bruce “up and away” can lead to more swings and misses. However, as you can see, if he does make contact on pitches that are up and in the strikezone, there is a pretty good chance he makes solid contact. Thus, the best place for righties to go is up and out of the zone (boxed in yellow)–hoping to get Bruce to chase. They can set these pitches up with breaking balls or changeups down in the zone immediately prior to change his eye level–increasing the chances of him chasing pitches out of the zone. Overall, Bruce is a much better hitter than Alvarez. He may strike out just as much as Alvarez, but he hits for a higher average and has a significantly higher on-base percentage. Also, when he does put the ball in play, it’s more likely to be a linedrive than balls off the bat of Alvarez. Being a better hitter, there are obviously fewer glaring holes in his swing. However, as I noted above, the Cardinals’ hard-throwing righties (which they have plenty of) best chance is by throwing pitches up and away–with their best chance on pitches out of the zone completely. This not only leads to more swings and misses, but also fewer line drives. Lefties can attack him low and away, just like with Alvarez. Siegrist can attack him up and away, but he must be careful because zones immediately adjacent to these somewhat “cold” zones show that he can be very dangerous. In short, Bruce is a much tougher hitter to pitch to than Alvarez. I hope the Cardinals can figure him out because at the age of 26, they are going to have to deal with his potent bat for years to come. Of his 51 hits, 11 of them were doubles and 11 more were home runs. Thus, 43% of his hits have gone for extra bases. He has knocked in 42 runners against the Cardinals–11 more than he has against any other team in his career. So what can the Cardinals do? Alvarez is a career .235 hitter who averages 141 strikeouts per season. He must have a lot of holes for the Cardinals to exploit, right? 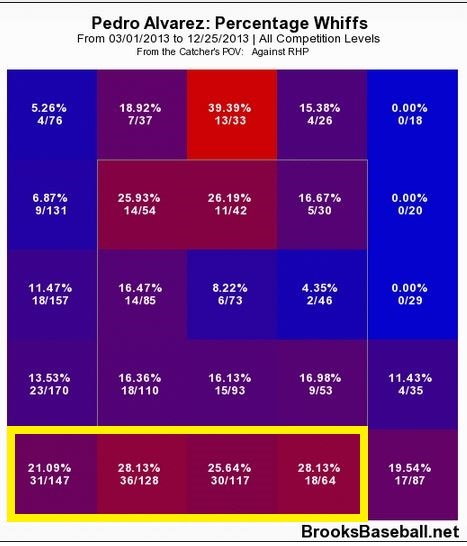 Well, I took a look at five different graphs from BrooksBaseball.net to see where he can be attacked. Now, I fully realize that the Cardinals already have scouts and pitching coaches relaying this information to their pitchers, but I figured it would be fun and informative for readers as well. At just 26 years old, fans will be seeing Alvarez take at-bats against the Cardinals for years to come. 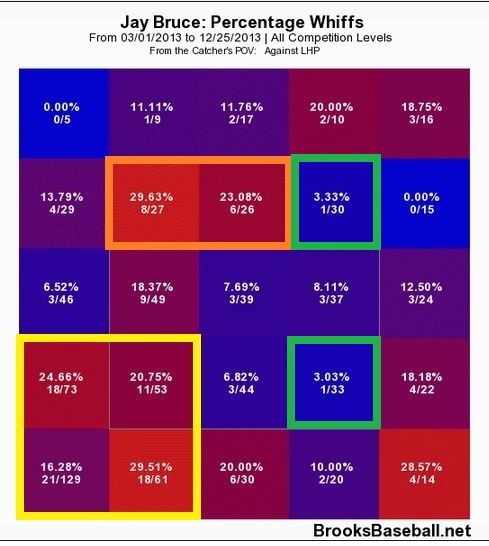 As noted on the graphs, but to avoid any confusion, all zones are from the catcher’s point of view. Against left-handed pitchers, down and away (boxed in yellow) seems to be the most vulnerable spot for Alvarez. This makes sense, though. Teams bring in lefty specialists, such as Randy Choate, to throw sweeping breaking balls down and away–daring him to chase pitches that usually end up out of the zone. 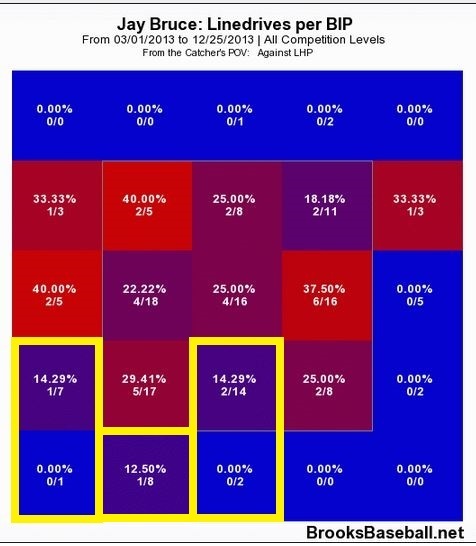 Of those four squares in the bottom left, Alvarez swung and missed (aka “whiffed”) on 67 of 242 pitches in 2013. His 27.7% whiff rate on pitches down and away was 6 percentage points higher than his average whiff rate (21.5%) against lefties in 2013. 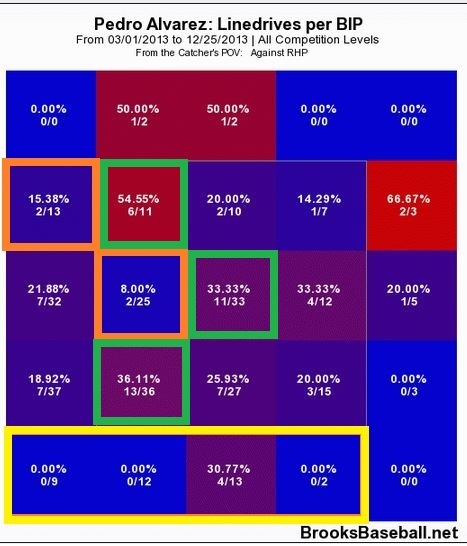 Also, if a pitcher is locating his pitches well, up and out of the zone (boxed in yellow) could be viable options with 50+% whiff rates in these boxed areas. However, very dangerous areas border these so it would probably be wiser to look down and away since there’s more room for error. Like with lefties, down and out of the zone is the way to attack Alvarez if you are a right-handed pitcher looking for swings and misses. 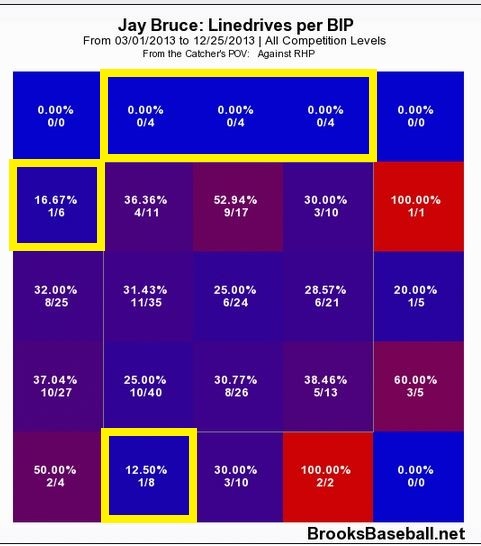 His overall whiff rate against righties in 2013 was 16.6%, but in the zones highlighted by the yellow box, his whiff rate was significantly higher at 25.2%. This was a pretty good sample size as well, considering 25% of the pitches from right-handers ended up in the boxed zones. Enough about whiff rates, what about balls in play? I’ve got you covered there as well. However, before I get into that, let me make you aware of a quick disclaimer. I chose “linedrives per balls in play” instead of batting average because I believe linedrives are a better representation of a hitter’s hot and cold zones than average. A high average in a certain zone could be tainted by a small sample size full of bloop hits; whereas a linedrive is a linedrive–regardless of whether it’s results in a hit or not. That same zone I highlighted on the left-hander whiff rate graph is highlighted here. As you can see, of 15 balls in play on pitches in this zone, only two of them (13.3%) were linedrives. 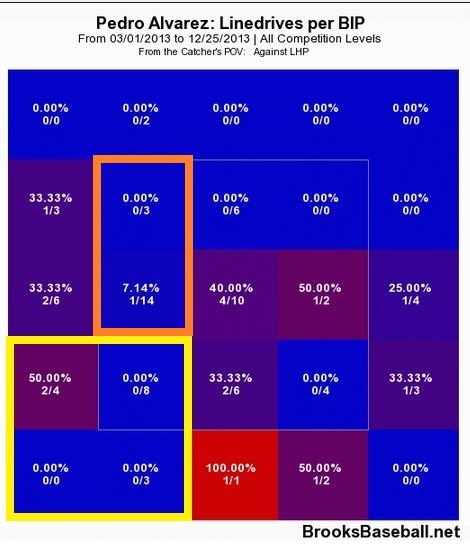 In fact, if you look at the zone highlighted in orange just above that, Alvarez had just one linedrive in 17 balls in play–leading to a very tame 5.9%. If you put the two left-handed pitcher graphs together, the way to attack Alvarez is down and away–looking for him to chase pitches out of the zone at times, which he does at a pretty regular rate. The same area I noted in the right-handed pitcher whiff rate graph is highlighted (in yellow) in this graph as well. Of 36 balls in play on pitches in this zone, only four of them were linedrives–11.1%. Considering the linedrive percentages in other parts of the zone, this is easily one of his weakest spots. I highlighted two other areas in orange that seem to be weak spots for Alvarez as well. However, if you take a look at the zones immediately adjacent to these (highlighted in green), a pitcher must have his best stuff if he wants to attack these two zones. Of his 36 home runs in 2013, five were to the opposite field (14%) and three were to center field (8%). It’s obvious that much of his pop comes when he pulls the baseball. This shouldn’t be news to anyone, though–just thought it was worth visualizing. Alvarez’s career batting average against lefties is .200 with 12 home runs. His career average against righties is much better at .248 with 74 home runs. The numbers show his bat is much more potent against right-handed pitching–also should not be news to anyone. However, as I showed in the five graphs above, both lefties and righties should attack him in pretty similar zones–down and away. I fully realize that the majority of the zones I highlighted were pitches out of the strikezone. Yet, until Alvarez proves he can be a more patient hitter, these zones need to be exploited. Plus, if he indeed proves to be more patient next season, I would much rather walk him on four pitches out of the zone than give him the opportunity to change the game with one swing of the bat–like he has done so many times already in his young career.